Home » Destinations » Guest Blogs » ​Are You This Kind Of Traveler? In our family Josh is a generation Y and I am a generation X by a few months. We might not travel differently, but I like to always remind him. :) How about you? What generation are you? Have you ever thought about the different ways generations travel? A destination family vacation is often hard work when there are so many differing viewpoints on where to travel and how to travel. We can define the generations through the labels the past decades have provided: Millennials are 18-34 years of age. Generation X (Gen Xers) range from 35-49 years of age. And the Baby Boomers (Boomers) are between 50-67 years of age. In a recent nationwide survey of travelers between ages 18 – 67 who stay in a hotel at least five nights per year for business, pleasure or both, Marriott Rewards Credit Card endeavored to gauge the global travel mindset of millennials. And it looks like the millennials are playing a whole new ball game when it comes to travel. From participating in volunteer activities or heading out on a charity trip to chasing thrill seeking adventures over a laid back beach holiday, millennials are leading the way in a new kind of travel. If you find yourself looking for new adventures while on vacation, you must be a millennial. Swimming with sharks, climbing mountains, glimpsing lions on safari, island hopping on jet skis or parasailing in Bali the average millennial is hoping for something more than just tanning on the beach. If nightlife is important then you must be a millennial. 28% of millennials consider local nightlife when choosing a destination abroad– nights out to eat, clubbing at the hottest clubs, drinking at the hippest bars. If celebrities or pop culture influence is where you are headed for that yearly vacation then you are most likely be a millennial cause the boomers usually define their hot spots using a travel or lifestyle publication. Spotted Kim Kardashian in the Caribbean? Then there’s the next hot spot, or maybe it was One Direction in Cannes that made your choice. The rise of the digital nomad is possibly one of the biggest reasons that millennial travel is on the rise. The ability to work anywhere and be anything has certainly opened up a whole new world. To always be able to Skype home, keeping in touch with loved ones to the ability to accept money anywhere in the world. Travel has gotten easier. And to help millennials and travel enthusiasts reach their travel goals faster, Marriott Rewards Credit Card from Chase offers accelerated Marriott Rewards points on all travel purchases. Literally saving money while traveling to spend on more travel. While boomers and Gen Xers are still taking their yearly or bi-yearly vacation trips, millennials are taking gap years and searching for deeper meaning in their travel experiences. 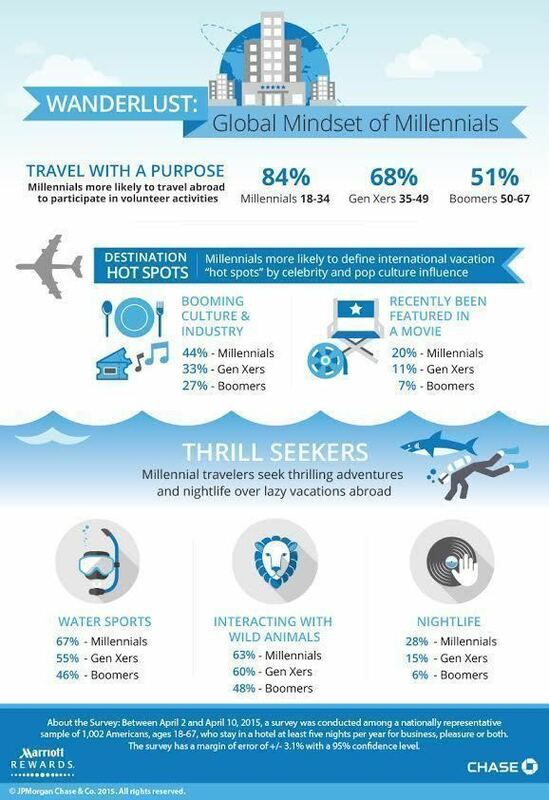 In fact compared to Gen Xers 68%, and boomers 51%, a whopping 84% of millennials are travelling for a purpose. So where do you fit in? Do you find yourself in a different aged category, but leaning toward millennial travel or are you completely out of the box? If you like earning points to put toward your next trip, visit Marriott Rewards Credit Card and whatever way you travel I hope it’s with meaning and a willingness to explore. Because there is a great wide world out there waiting for your discovery. This post was brought to you by Marriott Rewards Credit Card from Chase. The content and opinions expressed below are that of Jack Henry, guest author on Travel With Bender.